Brand loyalty doesn’t exist among us techies. We buy the latest hotness and rock it until two seconds after something hotter shows up. Those buying habits have migrated into my non-tech related purchases as well. I’ve owned a Chrysler, Ford, Nissan, Mercury, Honda, and Volkswagen…ONE each. Nothing in my tool box matches. Toothpaste, deodorant, underwear, shoes, appliances…any and everything I could ever buy falls victim to not seeing branded siblings sitting next to them in my drawers & closets. I’m just not the guy to count on for repeat business unless your company is always on the forefront of a particular product! Alias, there is one tech company that I’ve managed to stick with for 11 years. As you can see from the devices I’ve owned above, I loved Palm products. Maybe it’s because they made it so much easier to organize the happenings of my life, maybe is was all of the quality hardware they use to produce, or maybe it’s because I worked for them for a while (well, 3Com back when they owned Palm). I can’t really put my finger on the exact reason why, which in itself, kept me attracted to their products even more. Palm got lazy though, and about a year and a half ago I was going to finally jump on the iPhone or Android ship. Literally a week and two days before I was to make my move Palm announced the best mobile operating system to date…webOS! I crashed one of their Launch Parties that was held a few days before the public release, purchased one, and WOW, webOS was (and still is) amazing!!! The hardware it was on…not so much. 🙁 However, I stuck with it, defended it in geeky tech talks with some of my geeky tech friends, looked past parts of the device breaking off, looked past bubbles in my screen, and I got use to lagginess & other issues due to hardware limitations. I just knew Palm would release a high end well built piece of hardware that was deserving of webOS, so I remained patient. However, it’s a year and a half later and I find myself in the “ready to jump ship” mood again. The HTC EVO has been pulling at my Palm brand loyalty strings since the second it was announced. The spec sheet reads as if HTC hired me personally to come up with a super phone (far too many specs to post here but check out the link above and video below)! It’s exactly what I expected Palm to deliver, only in an Android wrapper. Past versions of Android were “klunky” (for lack of a better word). Google has done a great job with Android 2.1 though (the version currently on EVO). Android 2.2 (Froyo), set to release later this year, is looking extremely promising! So…I’ve decided to add an EVO to my account and try it out for 30 days along side my Pre. If I like it I’ll keep it and ditch Palm. It will be a bitter sweat day, as I still feel that webOS beats the snot out of the Android and iPhone platforms. Gotta keep up with the times though, and Palm just isn’t with it. UPDATE [06/02/2010]: I just played with an EVO at the Sprint store for about a half hour. 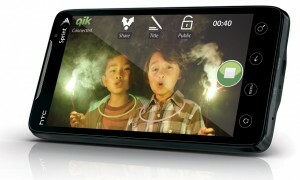 This is DEFINITELY going to be my next main phone!! !